There's hardly any introduction needed for ALDUB but everyone else who is not yet in the know, ALDUB stands for Alden Richards for AL and Yaya Dub (Maine Mendoza) for DUB. Both stars in noontime variety Eat Bulaga's Kalyeserye segment which airs alongside Juan for All, All for Juan Bayanihan of the Pipol. Kalyeserye means a series in the streets, literally because this segment airs during the J4AA4J portion when Dabarkads Wally, Jose, and Paolo (collectively called JoWaPao) are in random streets all over the Philippines, giving away gifts, cash, and more from EB's sponsors. ALDUB (or AlDub) started as an accident after an experiment from the show's director and production staff. J4AA4J first introduced Doktora the Explorer for the Problem Solving part when she wittingly and humorously solves issues using out of this world and hilarious herbs. Later on, Doktora's Lola Nidora was introduced along with her yaya, Divina Ursula Bukbukova Smash aka Yaya Dub portrayed by a budding Internet sensation, Maine Mendoza, best known for her comic dubbing videos using the popular Dubsmash app. Alden on the other hand had been a guest host on the show for quite sometime before Maine was introduced. Soon after EB's staff discovered that Alden is one of Maine's celebrity crushes, they asked A (Alden) to watch M (Maine) during her segment on July 16, 2015. The former obliged. Upon realizing that A was watching, M became conscious and went out of character. And the rest as they say is history because everyday since then (except Sundays when there is no EB), the two had been seen exchanging sweet nothings while lip syncing and dubsmashing on their respective split screen. The story was spiced by numerous twists including the introduction of new characters such as Frankie Arinoli to whom Yaya Dub was betrothed because the former promised to pay for the ransom of lola's kidnapped diary containing their family's deep secrets. There was also Duhrizz, lola's apo (grand daughter) from New York who kidnapped the star crossed lovers because she likes Alden and was jealous of Yaya. Let's not forget lola Nidora's sisters Tinidora (Jose) and Tidora (Paolo) as well. Rihanna Valenciano, lola's mayordoma is also a comical character along with other guests on the show including Gloria Romero as tiya Bebeng (the lola's tiya from the province), Lola Babah (Doña Barbara Latisha Rockefeller Vda de Faulkerson) - Alden's grandmother from Russia (Waray too) as well as her brother played by Eddie Garcia. Celia Rodriguez was also a guest during one of the earlier episodes. Jake Estrada had also graced the show as Yaya Dub's classmate. Cosmo Ph made a very informative video summarizing the episodes until September 26 when Alden was finally allowed to visit Yaya at the Explorer sister's mansion. But what made this love team different is split screen romance. The Cinderella type element is also present, making it something many can relate to. Although there is a script presented daily, most of A and M's reactions are very natural and unscripted. The script is also often presented on the spot while Kalyeserye is ongoing. You can hear the human prompter commanding what the character's are supposed to do next. The real score kilig factor can also be attributed to the fact that the two had never met in person and were advised not to contact each other directly until they are finally allowed to meet. They almost saw each other on September 5 when the two participated during the Bulaga Pa More contest as wildcard participants. Yaya Dub won between them but Paolo later on won the finale on October 10. During that same week, Alden was MIA on KS and EB due to a series of shows both local and abroad. He had been heavily criticized (along with his manager and the GMA Artist Center) for not prioritizing the show which made him even more popular than before. I have to admit that I have been one of those who were quick to judge. But I soon realize (I hope the others did too) that the guy was just too nice to decline even the most menial invitations from far flung barrios unheard of. Anyway, his schedule had been fixed since then and I've read that he is even transported through helicopters just to fulfill his obligations before and after each KS episode (just like the Tamang Panahon event Oct. 24 at the Philippine Arena followed by a guesting elsewhere in Manila). Poor guy, he probably doesn't get to sleep much since ALDUB became a major hit and both he and his onscreen partner Maine, had been in demand. The hashtag #JapanPaMore was trending in Twitter due to his absence and BasDub was introduced. Baste, the cute little 3 year old mainstay of EB took Alden's place while he was away. The latter was not in the dark and actually followed social media updates about EB and KS. He was even photographed while holding his phone with Maine's Instagram photo evidently showing. At one time, he was also pictured using a pillow with an ALDUB print. Speaking of hash tags, AlDub is now recognized the world over after trending in Twitter for several hash tags most specially #ALDubEBforLOVE for the September 26 episode and #ALDubEBTamangPanahon for the live broadcast at Philippine Arena which I was able to witness in person. The former broke Internet records with more than 25.6 million tweets and beat the Super Bowl's record last year. The latter is definitely the new world record now at more than 41 million tweets. These are some of the photos from the #ALDubEBforLOVE episode with the first image taken while Alden was serenading Yaya Dub with his cover version of Brian White's God Gave Me You. 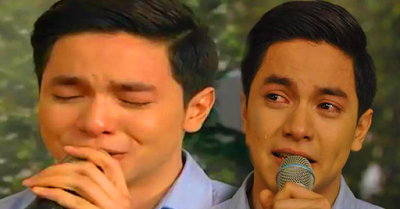 He cried during the performance and speculations flew all over the web as to why he cried. Some believe it was about the overwhelming blessings after Maine entered the picture since he was watching a VTR about the AlDub story while singing. Others thought he remembered his mom who died before he rose to fame. Well, this is still everyone's question but it's quite evident that the two are very good friends and really took to heart lola's advice to take it slow. The demand for ALDUB had indeed been overwhelming that after just a few months since it started, A and M as individuals or as a couple had been endorsing various products including McDonald’s, Talk N’ Text, Zonrox, Bear Brand, Coke, Hapee, Belo, Bench, Tide, Downy, and Datu Puti as a love team. Maine endorses O+ phones, 555 Sardines, and Rejoice while Alden is the brand ambassador for Boardwalk and Snow Caps. I'm sure the list will continue to increase. M is also promoting a L'Oréal lipstick brand similar to the one she was known to personally use, Ruby Woo from MAC. The latter apparently got sold out after people found out she was using it. McDonalds also reported a 470% sales increase since their AlDub commercial. The latter is one of the reasons why even business shows and magazines are interested in ALDUB. ALDUB, along with JoWaPao had also graced several magazines already, either on the cover or inside the magazine's centerfold. Yes! had to reprint the magazine several times for its November issue. 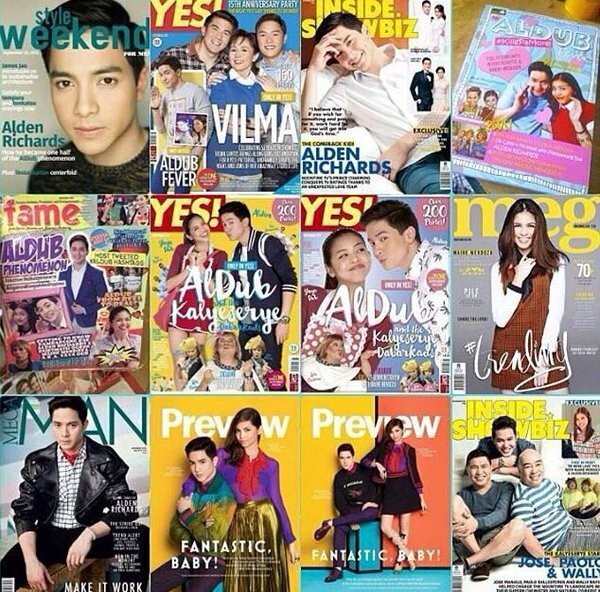 I have a copy of these magazines which I posted on a Pinterest board specially made for ALDUB. See ALDUB on Pinterest album. News outlets locally and internationally had also reported about AlDub including Bloomberg, BBC, and CNN. Although Alden isn't exactly the best singer, he can carry a tune. But nobody noticed his album released on 2013 until recently. The MaiDen (Maine and Alden) love team's success had been evident even on his recording career. The self-titled album released years ago had now reached Platinum sales status along with his latest Wish I May record. Alden and Maine was part of the 2015 MMFF (Metro Manila Film Festival) movie My Bebe Love alongside Vic Sotto and Ai Ai Delas Alas. Maine have guested in Raiza Mae's Princess in the Palace and Sunday Pinasaya (where Alden is a mainstay). Both have also been invited at Vic's Vampire ang Daddy Ko. I'm sure there will be more shows and movies lined up for them. But most of all, it's the moral lessons infused with every episode which made even the CBCP (Catholic Bishops Conference of the Philippines) a fan. Due to countless lessons alluding to old Filipino values, the show, particularly the main cast of Kalyeserye (JoWaPao and AlDub) had received numerous awards and citations from religious and cultural organizations as well as schools. Although I've missed episodes since the Christmas 2015 holidays, I'm still a fan and I check for updates when I have the chance to do so. These days, the show is expounding on characters mentioned during the Tamang Panahon event such as lola Nidora's Anselmo (the one that got away). I'm sure they can continue relating older stories as the show progresses so there are still a lot that this show can offer in weeks or even months to come. You can watch videos of Kalyeserye episodes through the Eat Bulaga official Facebook page - https://www.facebook.com/EBdabarkads/videos or their YouTube channel - https://www.youtube.com/user/eatbulaga1979 . There are also countless YouTube channels from fans which upload episode replays. Note: This is quite an overdue post. I started writing this last year but only published it today.